Read 2 times. Last read March 31, 2019. Every day Khalid marries a young girl and kills her soon after. When Shahrzad's best friend becomes one of Khalid's latest victims, Shahrzad vows that she will avenge her murder. Shahzad volunteers to be the next bride. She will not only stay alive, she will also kill the king. Night after night, Shahrzad entertains Khalid with stories, stopping just before cliffhanger endings. Intrigued, Khalid postpones her murder each and every day. However it isn't long before Shahrzad starts to fall in love with her new husband. This was a well-written read that I enjoyed immensely. I loved the world building and this story sucked me in immediately. At first I thought the whole hate to love plot was overdone but it is executed beautifully here. You can clearly see the chemistry between Shahrzad and Khalid and it is hard not to root for their romance. Shahrzad's stories are as captivating to the reader as they are to Khalid. This is an unforgettable read that I recommend to anyone who enjoys YA romance. 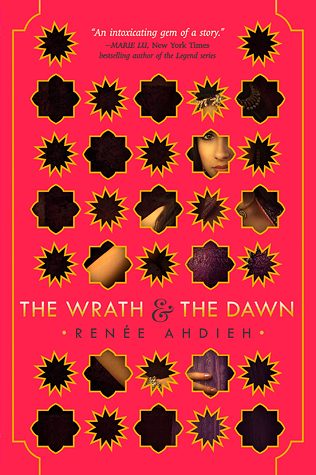 Sign into Goodreads to see if any of your friends have read The Wrath and the Dawn.